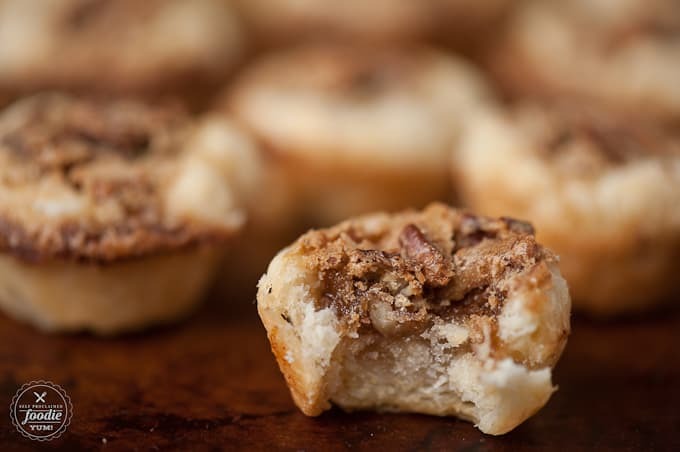 These bite sized and easy to make Mini Pecan Pie Bites have a buttery pastry crust and a sweet pecan filling. 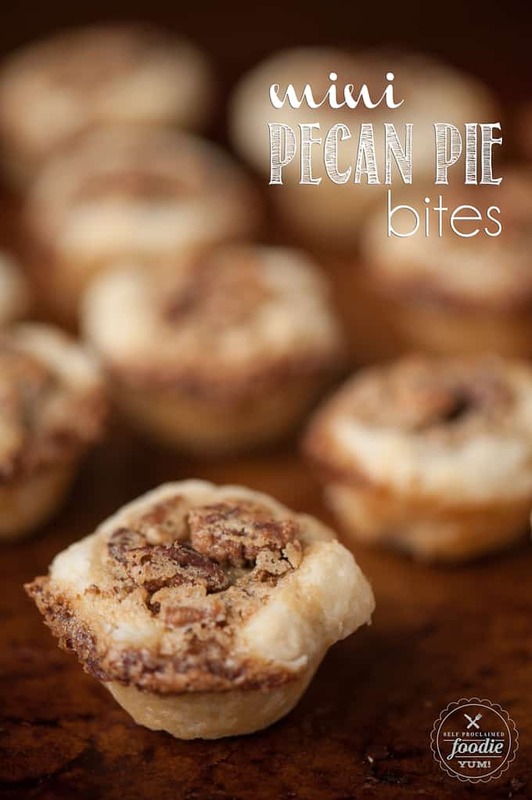 They taste just like a slice of pecan pie! We’re at day 10 of my 12 Days of Holiday Treats series. Time sure does fly when you’re consuming 5000 calories a day! To me, nothing says holidays quite like a piece of pecan pie. You know you have a rich dessert on your hands when, despite the fact that you’ve proudly built up quite the tolerance for sweets, you can’t possibly have more than one slice. That is what pecan pie is to me. I also love the fact that I never enjoy the wonderful flavor of pecan pie outside of the Thanksgiving and Christmas holiday season. I’ve been making these tasty cookies for years now. 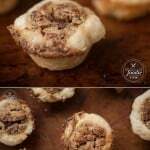 I love that they have everything wonderful that comes along with a good piece of pecan pie – the flaky buttery crust, the sweet and chewy filling, the candied pecans that get stuck in your teeth. But, anytime you make something bite size, you increase its YUM factor by 5x (that’s been scientifically proven, you know). How else would you bundle up the goodness of pecan pie in your cookie tin? You can’t! Using stand mixer with paddle attached, beat softened butter and cream cheese on medium speed until thoroughly combined. Stir in flour on low speed until combined, then flash on medium speed for a few seconds to fully mix. 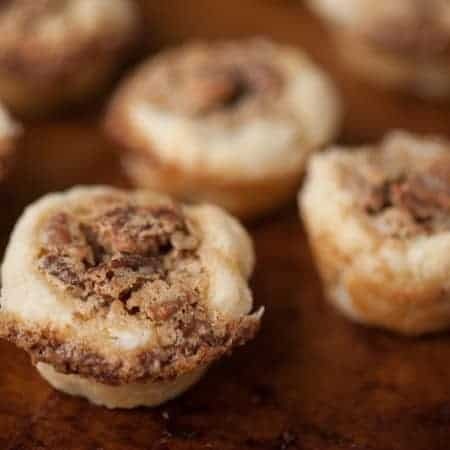 Using a mini muffin pan, press a rounded teaspoon of dough evenly into the bottom and up the sides of each cup. I used the round end of a wooden honey dipper to make the well in my dough. To make the filling, stir the brown sugar, egg, melted butter, vanilla, and the chopped pecans together in a bowl. 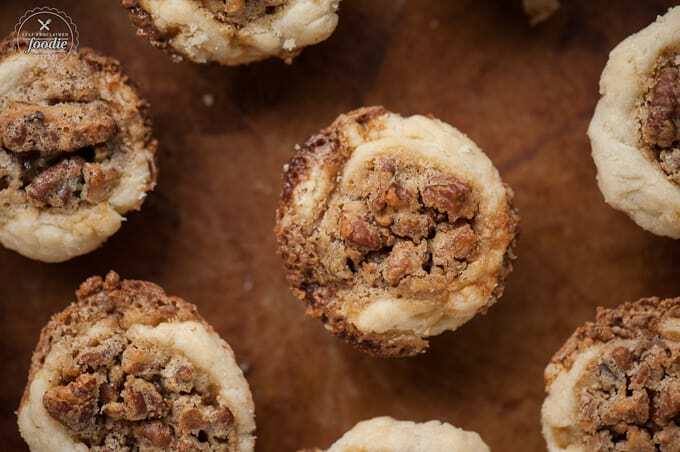 Fill each pastry well with a heaping teaspoon of pecan filling. Bake in preheated oven for about 30 minutes or until pastry is golden and filling is puffed. Cool slightly in the muffin cups, then remove and cool completely on a wire rack. You forgot to include the pecans in the recipe 🙂 Can you please update this post and let us know how many pecans (i.e 1 cup?) ?? Thanks! How much pecans? Any vanilla or salt?